Yes, it worked for me, although I read it on the other website and I have updated the BIOS before opening the PC. And before I tried million of way, nothing worked – the unit kept switching off, when working from the battery, or hanging when disconnecting power. Now for two weeks – no shutdown, no hanging. Works like a clock! However, it is not very clear why simple re-connection of the battery enabled this magic?.. Probably the unit needed to reset some memory buffers which were fed by the battery otherwise. This post was a life-saver – my son is a Freshman in college and had this power issue yesterday – he has a final exam tomorrow and a term paper due in a few days and all of his info was on the solid state drive; so needless to say he was panicking when ASUS told him that it would take a month to get it fixed. I had him print this post out and bring it to Best Buy — “shout out” to the Best Buy in Oshkosh WI for performing this procedure on his computer and didn’t charge him a penny! This post was awesome as it worked perfectly!! It worked. I wonder if the battery can be replaced. They eventually go bad. I can turn my ultrabook on again 😀 the instructions was very thorough and worked perfectly. I just don’t know if i should update the BIOS to prevent it to happen again. What would your advice be? With the harness, am I suppose to pull up on the whole thing or just the part that’s inset? With the former, there’s no way to get leverage without risking hitting the board. With the latter, it seems like it’s impossible to find a tool to fit in the gap. If you could give some more details I’d appreciate it as I really need to fix this. Lifesaver! Great article. I’ve had to apply this method a couple times – on both my battery AND the keyboard connector. Love this Asus UX-31 but it sure seems as though Asus scimped on the quality of these mini-connectors. Thanks a lot, that worked for me. I thought it wouldn’t start because the screen is broken (which it actually is, hope I’ll be able to change it), but it was indeed because of that BIOS issue. Now it boots again, even with the screen completely disconnected (so if someone is in the same situation : the screen is not required for this laptop to boot). You rock! Totally saved time and money. Additional tips that helped me were: I used a bright flashlight to illuminate what I was doing. Under the bright light I could see that I could get UNDERNEATH the wiring harness and lift it up with the blade of the finest scissors I could fine. Otherwise, I kept struggling with trying to pry it out from the sides. Once I got under with the help of better lighting, it popped right off. A million thanks! Just wanted to say thank so much. This worked a treat on my dead Zenbook and as a non-technical person who found your instructions really easy to follow, I am grateful. Unfortunately this didn’t solve my issue. When I turn it on, the wan goes on with power button LED, but nothing else happens. Before it broke it was in BIOS mode for 20-30 minutes, then suddenly turned off. Anyone have some ideas? If yes, my email is t00mas@hotmail.com Thanks! Another vote of confidence from me, thanks Thor. I performed this on the UX31E that wouldn’t power on and the re-connection of the battery pack did the trick. I tried to be gentle with the connector but found it was ok to pull (softly) on the black ring. See this YouTube video for a demo, it happens in the first minute and you can get an idea of how to remove it. Guys, (sorry my english, it is not my mother language) my situation (onable to power on the machine). I was operating the machine fine but kept in mind I must not power down. Only sleep. Once I power down and I could not power on for few days. Got crazy. – tried disconet the main battery as well as the little bios battery for 12hrs. THen I read somewhere about possible keyboard cable improper attachment in the plug. BINGO ! GOT IT! This was the problem in my case. I have unplugged the keyboard plastic thin cable, cleaned the contacts by a cloth, plug it back. I paid attention to follwing: there is a white color plastic piece that is bellow the cable. But this is the critical part, you must push it toward the plug adfter you plug the cable, it locks the cable at the position and may be it pushes the cable contacts agains the plug, whatever … I did it with some gentle power – on left and right side as pushed it toward the plug. THe white plastic piece has got locked at certain position that I believe is the final position it has to be so. You, dear sir, are a gentleman and a scholar. Thank you so kindly for your contribution to the knowledge base. You are a life saver!! I can kiss you right now!! Thanks so much! I had that problem with my Asus Ultrabook.I followed the steps you recomanded,including 5 minutes of injury,and my Asus began to work.Thanks a lot!!! Thanks for your post on this. I am having the same problem. When I follow your instructions, I am able to boot without the battery attached. If I attach the battery, I am unable to boot. I can attach the battery while in windows and it is recognized, but as soon as I shutdown, I can’t boot up again. No idea why this would be. Sorry, I’m just finding this article in January 2015. I just replaced the battery on my UX31E because it was only holding a charge for a couple hours (I’ve had the Zenbook for about three years). The netbook works perfectly on AC charge. It boots up just fine on battery in Windows 7 Safe Mode. **However** when I try to boot directly into Windows on the battery, it shuts down immediately. So, it works on battery in Safe Mode but not in standard mode (shuts down). That tells me the battery is functioning fine, but something in Windows itself is affecting the boot — but still has to do with the battery. The battery driver perhaps? I didn’t need to unplug the battery or update the BIOS. The X31 has a loose keyboard connection and it is fairly well documented, usually associated with unresponsive individual keys while typing. For me though, it also make the power button a total flake. Once I pushed the keyboard ribbon more firmly onto the motherboard (several you tube videos help with this, but of course I can’t find the one that was most helpful… you don’t push down toward the keyboard, you push the ribbon laterally into the connection more firmly), and VIOLA. No power button issues and no terrifying BIOS upgrade. Worth a shot, perhaps? Worked for me brilliantly. You need a TORX 5 screwdriver, which I keep in my briefcase, and wind up reseating the keyboard every 4-6 weeks. fyi, sometimes you can avoid taking the whole thing apart but just leaving it open and not plugged into let the battery completely run down. Then (before reconnecting power) hold the power button down for a while. Back in the days of desktops, disconnecting power from the wall and then and pushing the power button caused the PRAM or something to reset which often magically resurrected seemingly totally dead computers. I’ve done this twice with my ASUS netbook, once it has sat long enough to let the battery totally die and it has worked like a charm. No luck this third time though, alas. SUPER! You saved my life! Thanks a million! 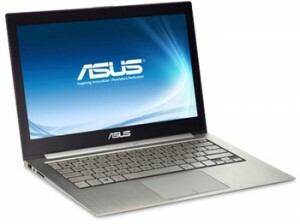 I have an Asus Ultrabook touchscreen. OUt of the blue, my one year old laptop that I use maybe once a month (at the most) just to save pictures of my 8 month old son, the unit just went to a blank screen. I can shut down, reboot and get to the login screen. I can login and then it goes straight to a black screen. If i press enough keys I get a video/audio error of some sort. I was able to reboot and hit F2 to get into the bios but there are no real setup in there that helps or any “boot” aides. So I’m stumped and planning to see if I can still get warranty on this thing (paid $700 for it around a year ago and barely used it). My question is, do i have the same problem as what is being remedied here by disconnecting/re-connecting the battery or is this something else and I should avoid opening the unit and try the warranty route first? Thank you for anyone’s help/input.